Sodexo’s most recent retaliation against workers was the last straw at George Mason University. On Wednesday, more than 100 food service workers at GMU went on strike to protest the unsafe working conditions they’ve experienced while on the job. The workers say Sodexo has responded to their demands with retaliation instead of providing the proper protective equipment. Last week, when workers and students at the Virginia school delivered a petition to Sodexo management raising health and safety concerns, Sodexo responded by changing the assignment of one worker leader of the delegation so she would no longer have contact with students. Yesterday, Sodexo workers stood up for their rights at GMU and voted to walk off the job to protest workplace injuries and Sodexo’s attempt to intimidate them. Workers have already protested Sodexo last spring at GMU, after facing intimidation for supporting a union. And wages for GMU workers are so low, most of them cannot afford Sodexo’s expensive health insurance – making safe jobs and union contracts necessary to improve their lives. Since 2000, the U.S. Occupational Safety and Health Administration (OSHA) and various state workplace safety agencies have found 160 violations and levied penalties of more than $200,000 against Sodexo for health and safety problems at its various worksites across the country. Filed under: Local Events, News, Protest, Use Your Voice! | Tags: Clean Up Sodexo, GMU Sodexo Workers Strike! The Sodexo workers at George Mason University marched on the JC North Plaza today, demanding higher wages and healthcare. After delivering petitions yesterday to Denise Ammaccapane, Sodexo Resident District Manager, who refused to accept them, the workers decided to it was time to finally make their voices heard. 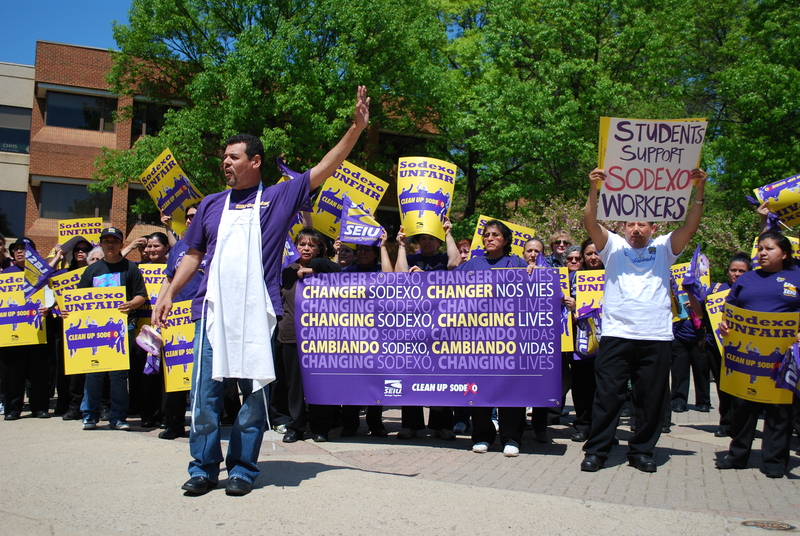 Over 70 Sodexo food service employees marched from Braddock road down to the Johnson Center. The Animal Rights Collective hopes that this move will finally force Sodexo to give employees the dignity and respect they deserve. Email Denise Ammaccapane and let her know that you don’t support GMU & Sodexo’s poor treatment of workers: Denise.Ammaccapane@sodexo.com. In response to rampant mistreatment by food service contractor Sodexo, around 75 cafeteria workers at George Mason University went on strike today. The one-day work stoppage is in protest of Sodexo’s attack on workers’ right to raise their families out of poverty by forming a union with SEIU 32BJ. “All we want is respect and to improve our lives but Sodexo management has only responded by intimidating and threatening us”, says Andres Ujueta, one of the striking cafeteria workers at George Mason University. Despite their dedication and hard work, GMU cafeteria workers earn a poverty wage–as little as $8.65 an hour. With Sodexo’s healthcare plan costing $240 a month, most workers say they can’t afford health insurance for their families. Since George Mason cafeteria workers began forming a union, they have been subjected to harassment and intimidation by Sodexo management. Earlier this month, the workers voted to strike. Before taking this action, workers have demonstrated their support to form a union by holding rallies and delivering petitions to Sodexo management. Yesterday, union leaders representing Sodexo workers in England and France met with George Mason cafeteria workers and students and were shocked at the conditions and treatment workers faced.